Tomorrow is December. December is tomorrow! Finding gifts for the children in your life doesn’t need to feel like one more obligation. Tune in to the child, and where they are right now, at this moment in their life. Pay attention to what they need, or don’t need. Have you already won the global lottery? Acknowledge it. Apply the buyerarchy of needs (see below). Give from a place of peace, generosity, and unattachment. Receive in the same way. We usually give one main gift, one book, and one stocking for each of our children. It winds up being more than enough (especially with generous extended family members), but helps to avoid gift-unwrapping overwhelm. You’ll find this list is longer than that, in part because I wanted to recommend books and products that our family has experienced and enjoyed. I’m also planning to offer myself the gift of a social media break during the holidays, something that I think the whole family might enjoy. May your December be one of peace, joy, and gratitude. In the Town, All Year Round book — If you have a child in your life who likes to point at pictures in books, you owe it to them to give them this book. Jasper is 6, and he loves to pour over each page, but a beloved friend of ours (who was 18 months old when we gave it to him last Christmas) has literally worn the binding off the book with frequent page-turning. The best quality crayons — pricier than other crayons, but the last ones you’ll ever need to buy. Amaryllis or paperwhite bulbs — hear me out: those boxed bulbs you find in any box store are fast-growing, with dramatic results. Kids of all ages will love to plant, tend, and observe their very own indoor bulbs, and they add such beauty to a January day. These also make great gifts for children to give to someone who will send regular updates on how the bulbs are growing, a connection Jasper and his great-grandmother have shared in winters past. Micro Mini Scooter — my kids each have one of these sturdy scooters, and Sage has been riding hers since before she was 2! With their three-wheel design, they are safe, speedy, and stand upright on their own. A must-have for getting to the beach and the library. Morakniv Rookie — a great first knife for use outdoors, with extra safety features. Perfect for sharpening sticks. Hand vacuum — something Jasper specifically asked for! Read more about our advent of adventure — an experience-focused holiday tradition. And a bit of evergreen holiday wisdom, from December of 2015. Disclaimer: this list includes affiliate links in which I earn a tiny percentage of any purchases made via these links. If you do decide to gift any of these items, consider doing so through the links on this page. Put your baby on the floor. Like, a lot. With Sage, I still make sure to spend plenty of time holding, cuddling and carrying her while she’s so sweet and small. But I also give her plenty of time and space to explore and get to know her body and how it moves. her view is unobstructed. No crib bars, no pack and play mesh. Just a wide open view of the room and everyone in it. she is free to move. With a lots of space to move, she does. it doesn’t require putting baby into any position that she can’t get herself into or out of. It doesn’t give her an unnatural sense of her own capabilities. It doesn’t prop her up to sit before she can get there herself, it doesn’t dangle her into a false standing position. She is simply on her back until she rolls on to her tummy. She is reaching and stretching and eventually moving. The key ingredient is lots of comfortable space. There will be a mat, a blanket, or something soft but supportive for baby to be on. A few yoga mats side-by-side can work. 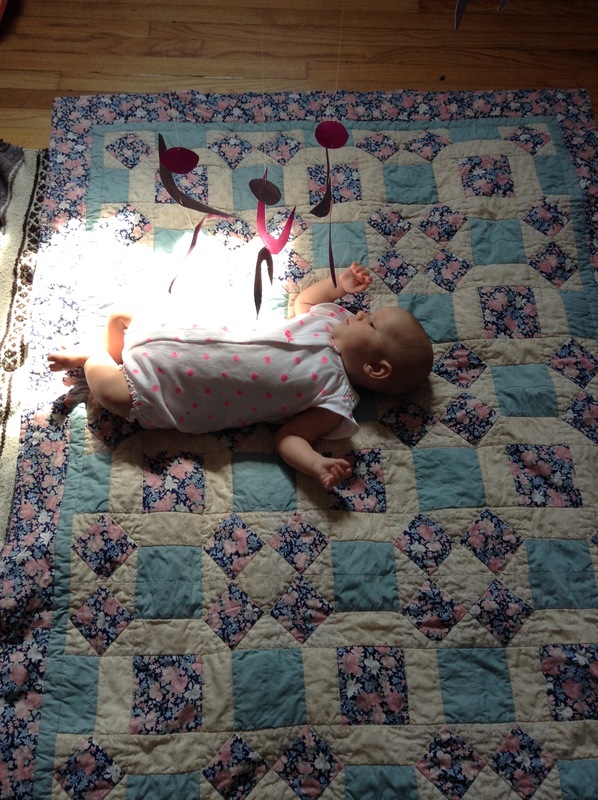 I’ve found quilts are better for movement than other types of blankets (they lie flat while being crawled and squirmed on!). There may be a mobile suspended above a young baby to look at, or a bell, ring, rattle or grasping toy for babies who are ready to use their hands. 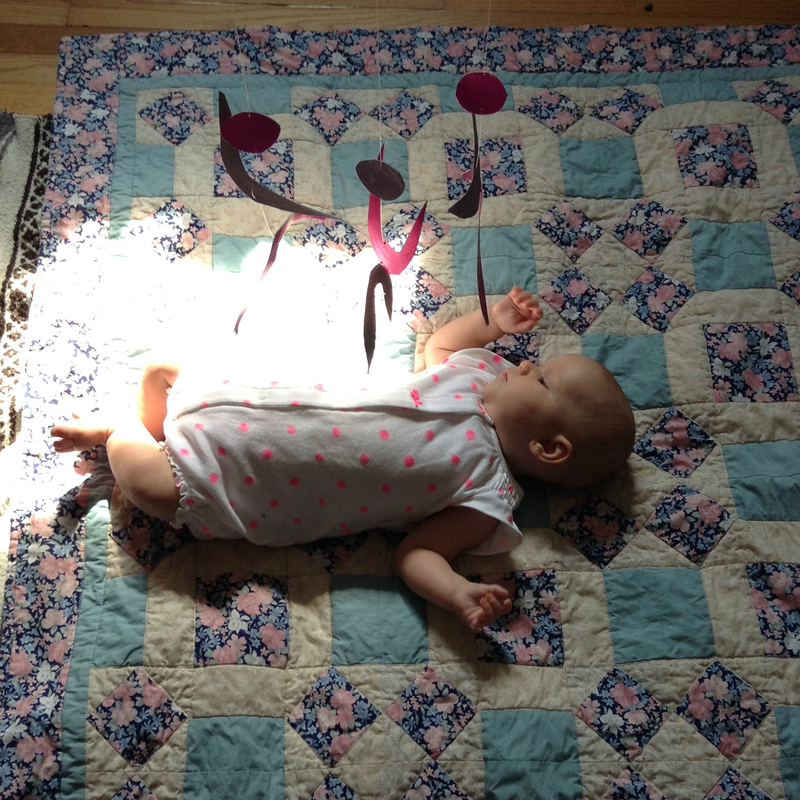 At five months, Sage is rolling and creeping to move around, and I sometimes place an object (a skwish, or a open book with beautiful images) just out of reach for her to stretch towards. Traditionally in the Montessori method, there is a wall mirror from the very beginning, which draws baby’s attention and allows her to watch her own body move. Our family chooses to incorporate the mirror later. 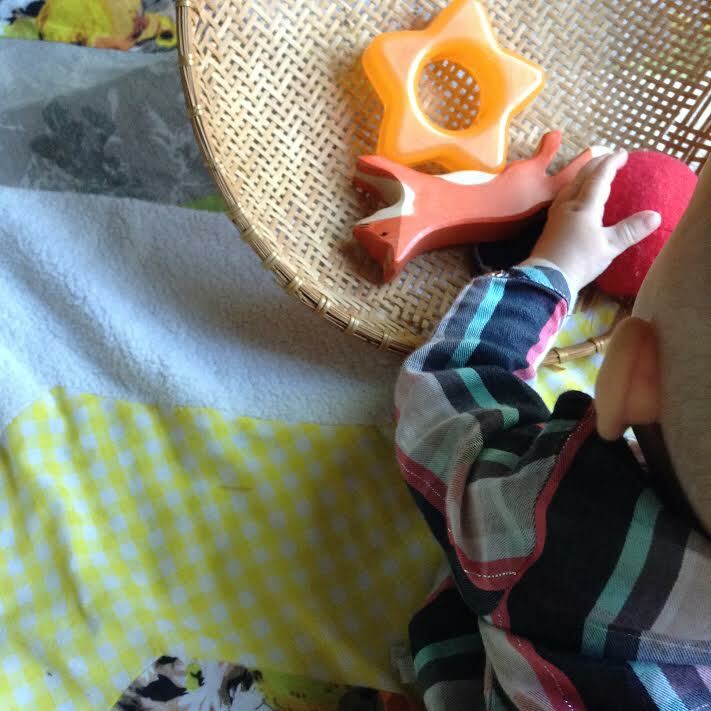 As baby begins to be able to move, there is a low shelf or basket offering a few objects to explore. Also: if you start to worry about your babe, or feel he is not getting enough people time, or that she’s all alone on a big empty floor — hang out with your baby! Sit on the floor. Talk to your baby. Pick her up for a cuddle. Do some made-up yoga poses to stretch out that breastfeeding back. Sit with him lying between your legs. Read a novel while she rolls around. Talk some more. 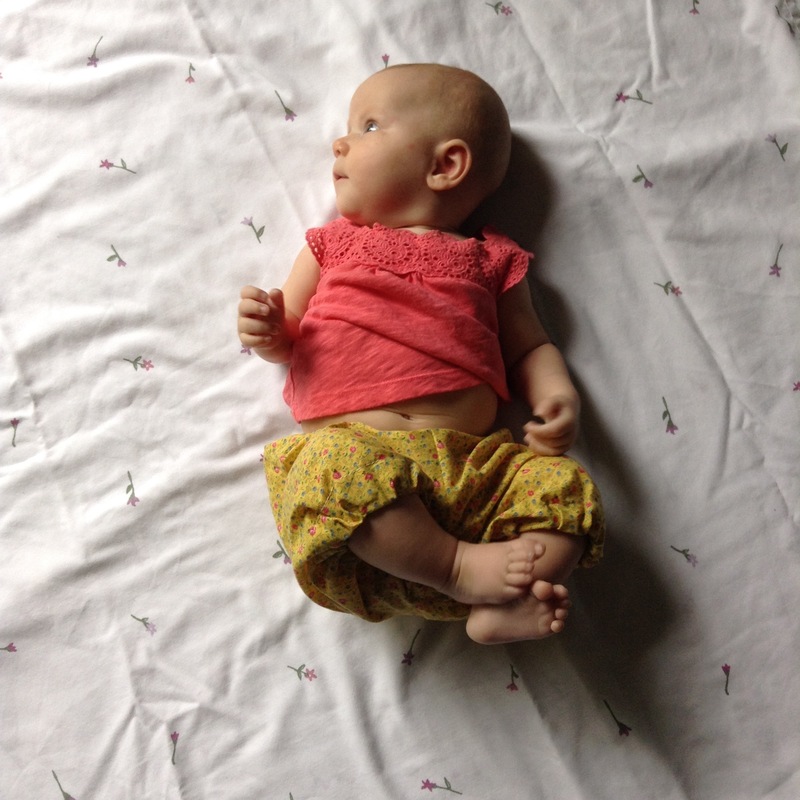 It’s all about living life together, while giving your baby space and time to move freely. That’s it. For more inspiring movement area images, check out this comprehensive post from Nduoma and this great round up post from How We Montessori. As the time of our baby’s birth rapidly approaches —I’m at 39 weeks now — I’ve got our home on my mind. Whether it’s nesting or necessity (how to find space for a new babe without making two-and-a-half year old big brother feel out of place? ), clearing out the corners and figuring out new configurations is taking up a lot of our family’s time and energy right now. With all the bustle around here, I’m thrilled to be taking part in a new e-course that starts up this week. Simone Davies, who runs parent-child classes and playgroups at Jacaranda Tree Montessori in Amsterdam, has brought her knowledge and experience to the global scene with The Montessori Notebook, with the aim of helping parents bring Montessori ideas into their family’s daily lives. Designing Space for Montessori Children is the first e-course from The Montessori Notebook, and I’m thrilled to get on board. I’m looking forward to being refreshed and inspired, and to re-prioritizing our home to meet the needs of everyone — especially as three become four. If you can’t join this e-course, I highly recommend signing up to receive Simone’s excellent monthly e-newsletter. It’s a gem, and it’ll be a great way to keep tabs on upcoming courses (like the free Intro to Montessori course promised for later this year). Now that Jasper is 18 months old, I’ve been doing some thinking about some changes that need to happen to make spaces around our house useful and welcoming for him. We recently made another trip to Ikea, something that seems to be required every six months or so to update for the next phase (using Ikea for Montessori in the home is its own post). When you focus on following your child, it’s not only the kid that changes, it’s everything else too. It seems like there are simple modifications to be made all around the house: a step stool placed in front of the “big potty” (we currently use a Baby Bjorn potty & lift Jasper up to the toilet when he asks); swapping out the books from the top of Jasper’s book case — he can now reach the top shelf — with other materials, and instead keeping just few books in the open vintage suitcase next to his bed; placing a step stool below the light switch (or investing in a Kidswitch). As I think about what’s to come, I find myself looking back. Last summer, while our friend Selena was here for a visit with her family, she asked us about Jasper’s bedroom, and shared about it on the Disney Baby blog. The thing I love about Selena is that I didn’t even bother to go upstairs with her — I knew she’d make us look good. A true friend is one who’ll move the diaper pail before she takes a photo. It was a fun process, and we discovered a few things along the way: one, that we had included more Disney than we’d ever imagined or intended, and two, just how much love and history was involved int he making of our babe’s space. He’s grown so much since then, I’ve learned so much since then, and his space is changing too. His room is already very, very different than it was when Selena captured it. Have a look to see Jasper’s bedroom as it was when he was just 9 months old. How has your home grown with your child? What are your must-haves for doing Montessori at home?